Are Charter Schools Good or Evil? Political campaigns demand heroic contrasts. Red! Blue! Black! White! Subtlety? Nuance? Pshaw! Superheroes don't wear plaid. The democratic process tends to leave a slime trail. It's easier to motivate people into action when they are angry or afraid than when they are listening. Even in down-ballot races, as campaigns accelerate toward deadlines, they tend to gravitate to simple messages. The system isn't just in need of changes, it's Fundamentally Broken! This isn't about policy choices, or degrees of competence. It's about Thwarting the Forces of Evil! Winning an election only requires winning more votes than the other candidate. Because negative messages tend to "stick" more easily than positive ones, the democratic process tends to leave a slime trail. Find issues that voters can get mad about, get those things to "stick" to your opponent, and you win. At least in the short term. Some candidates for school board positions have found that "going negative" on charter schools can be a winning campaign message. Others have benefitted from "going negative" on traditional schools. In both cases, there's a lot of misinformation out there. As we explain in Ed100 Lesson 5.5, charter schools are publicly funded schools usually created by parents and teachers and managed in a way that is mostly independent from school districts. By law, charter schools must be non-selective, non-religious, and tuition-free. They operate with somewhat less regulation than traditional schools. They are also unguaranteed: if they don't deliver on the commitments under which they are authorized, they can be shut down. On average, public charter schools tend to perform about the same as most traditional public schools in terms of test results, graduation rates and other objective measures. But it is also true that among the schools in California producing the most impressive results for students that are black, Latino, or poor, there are large numbers of charter schools. Many parents want a shot at something that might be better for their kids. 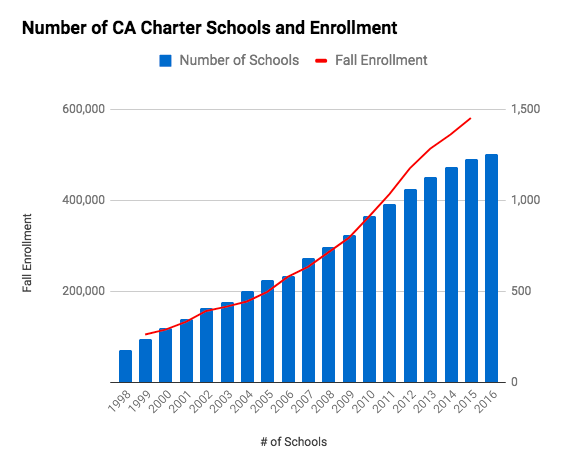 For a quarter of a century, charter schools in California grew quickly, and charter schools now exist throughout the state. At present, enrollment in public charter schools has grown to about one out of ten students in California, with significant local variation. In recent years, however, growth has slowed or even stopped. Teachers unions supported the original idea of locally created and governed charter schools to encourage innovation to improve education. But as the charter school sector has evolved, teachers unions now oppose charter schools that have strayed from that original concept. They now seek laws to hold charter schools to the same transparency and accountability standards as traditional public schools and to protect against the what they call the “diversion” of public funds from traditional public schools. The California Teachers' Association, through its Kids Not Profits campaign, denounces “privately managed” charter schools as part of an "anti-public-school billionaires' agenda". Unions look to support school board candidates who share these views. From the start, competing for enrollment has been part of the "big idea" for charter schools. Over time, the theory goes, parental choices impose a kind of Darwinian pressure on schools. Schools that do a great job of satisfying parents win enrollment and the funding that comes with it. Schools that don't satisfy parents lose enrollment, and must scale back or close down. Some school districts have responded to this pressure by removing or softening school attendance boundaries, allowing parents a choice of schools within the district. The school assignment system in San Francisco, known by many as the school lottery, is a fairly representative example. Created decades ago to provide more integrated schools, it allows parents to request any school in the district. Currently, a small number of charter schools in California are organized as for-profit businesses. Numerous scandals have led to bills to ban for-profit charter schools; one such bill passed in 2016 but was vetoed by Governor Brown. This issue isn't going away: a similar bill is in the works. Do Charter Schools Harm Traditional Schools? Public charter schools, by their nature, compete with traditional public schools within a school district. They compete to enroll students, for example. They compete for access to bond funds for facilities. And they compete for reputation. When charter school organizers recruit families to enroll, it's not in their interest to emphasize the positive aspects of the school district. School district superintendents and board members are keenly aware of this competition and their market share, especially in districts that are struggling for other reasons. There is a real temptation for school boards to squash charter schools. So why don't they? There is a real temptation for school boards to squash charter schools. So why don't they? The charter school presents an unsound educational program. The petitioners are demonstrably unlikely to successfully implement the program described in the petition. The petition does not contain the number of required signatures. The petition does not contain an affirmation it will be nonsectarian, nondiscriminatory, shall not charge tuition, and other affirmations, as specified. The petition does not contain reasonably comprehensive descriptions of the required elements of a charter petition. If a charter application is rejected by a school district, it can be appealed to the county board of education. If rejected by the county board, it can be further appealed to the State Board of Education. The law does not permit the State Board to reject charter school plans on the basis that they compete for enrollment or that the school would have a negative impact on students in traditional schools. As of 2018, 36 charter schools in California have been approved through appeal to the State Board. Gordon Lafer of the University of Oregon's Labor and Research Center argues that this competition can be corrosive in an influential paper, Breaking Point: The Cost of Charter Schools for Public School Districts. New charter schools, he points out, can exacerbate the problems of traditional school districts that are already struggling. These impacts are not cost-free, and he argues that the charter law should be amended to require that they be quantified and weighed as a factor in the charter authorization process. Charter school advocates counter that traditional schools should not be protected from competition, and this amounts to an excuse for trapping children in schools when a better alternative is at hand. The school authorization process is hardly sudden, they argue, and it's up to districts to plan for the transition. Democracy is a competitive system — famously the worst form of government except for all the others. In the course of making choices, it generates bruised winners, sore losers, and a whole lot of negative energy. We put up with it, but the negativity leaves voters with a pretty low opinion of their leaders and the system as a whole. Allowing parents a choice of schools creates a competitive system, too. The case for school choice argues that when schools compete, parents have choices, and children get better schools. It is important to acknowledge that the competitive process has hidden costs, too. School choice can be nasty. Under pressure, charter school boosters have a lot of bad things to say about traditional public schools, and vice versa. Negative messages stick more easily than positive ones, and unfortunately the sum of the messages can produce a jaded view of both sides. Thank you for listing a set of pros and cons. In the end, do you prefer allowing charter schools to exist or would you rather have a single public school system where all resources are directed at making it as good as possible? Our pleasure! Thanks for your comment, gresimmo1. Charter schools aren't going away any time soon. As far as preferences go, I prefer that every California child receives a great education :) How that education is delivered, whether through a fabulous public school, a great private school or a terrific charter school, I think should be an individual decision. That's one reason why Ed100 is committed to helping parents learn about the education system--there are important choices to be made and informed parents are better prepared to make them.